The enchanting hill station of Dharamshala has for long enthralled human population, which is why perhaps the British also made it their summer capital for a long time. The seat of the current Dalai Lama, Dharamshala is visited by several people to receive spiritual discourses as well as for its captivating beauty. Every year thousands of tourists flock to Dharamshala from not just India but across the globe to take a plunge into the natural beauty of the hill station. Reaching Dharamshala is not at all a Herculean task. The hill station is easily accessible through Air, Rail and Road transport. To know more on how to reach Dharamshala just have a look at the information below. Dharamshala can be easily and quickly accessed by undertaking an air journey. The nearest airport to Dharamshala is the Kangra airport which is merely 10 km away from the main town of Dharamshala. Another nearby airport is the Gaggla airport which is just 13 km away from Dharamshala. Chandigarh is another principal city of north India which has a major airport and is situated at a distance of 239 km from Dharamshala. The capital city of India, Delhi is located at a distance of 514 km from the hill station. The nearest railhead for Dharamshala is Pathankot which is situated at a distance of 85 km from the hill station. It takes a time span of about three hours by road to reach Dharamshala from Pathankot. Undertaking a rail journey from New Delhi to Pathankot is the most comfortable and cheapest means of reaching Dharamshala. The overnight journey in Jammu Mail from New Delhi to Pathankot is a time saving mean of reaching Dharamshala. The railway station at Pathankot is an important station and is connected to several cities of India through an excellent rail network. Owing to well maintained roads, reaching Dharamshala by undertaking road journey is also an option tourists can choose from. From Delhi and Simla especially it is easy to reach Dharamshala in an overnight bus ride. Several state buses as well as luxury Volvo buses ply between these cities. 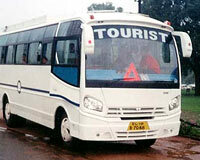 Bus services are also frequent between Dharamshala and Manali. The hill station of Dharamshala is connected to many other northern India towns by the National Highway-1, which enable a smooth and quick road journey to the beautiful town.